Electrical work can be dangerous and even fatal in the wrong hands. 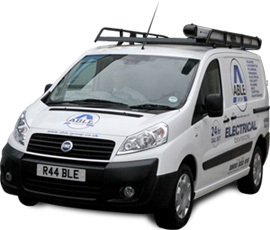 The Able Group provide trained and qualified electricians for all types of electrical work including testing, repair and installation. We have a security vetting system that guarantees each electrician we supply is of the very best standard. When electrical gas work is involved we will make sure that the electrician who arrives at your domestic or commercial property is gas registered and safety approved. Customer Name: Mr R Howard. I would like to pass my thanks onto your engineer Zia, he was very helpful and knew exactly what had to be done, I was very happy with his work.